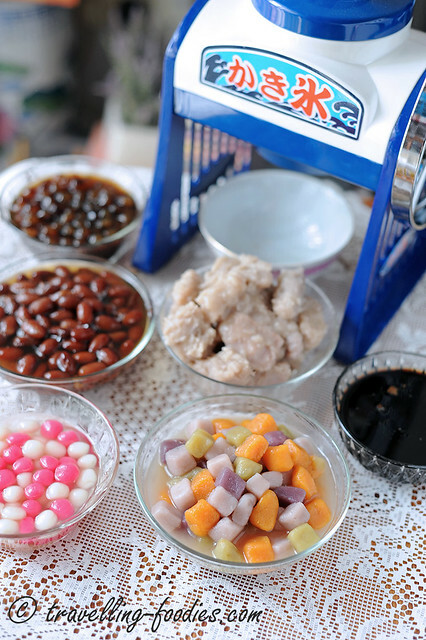 Despite being very famously associated with Jiu Fen, the taro ball dessert didn’t start here but instead was innovated by a lady called Mdm Lin who lived in 瑞芳 Ruifang more than half a century ago. Ruifang is another small town located at the bottom of the mountainous regions of Jiu Fen and thus serves very much as the “gateway” to the mining town located futher up amidst the mine hills. As such, everyone going in and out of Jiu Fen had to pass through Ruifang, and it remains so even till today. It started as a side income while helping her mother-in-law look after her shop selling sundries and provisions but soon became very popular, amongst the local mining families as well as visitors in the area. 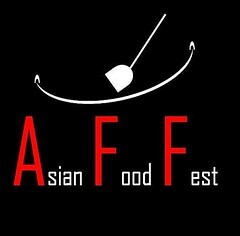 Her delicious taro balls spread by word of mouth through the masses and soon everyone knew about it. However, as mining activities in Jiu Fen came to a complete halt a few decades back, traffic through Ruifang also quieten down considerably and so did Mdm Lin’s business selling iced taro balls. Within the revival of interest in the quiet town with Hou Hsiao-Hsien’s movie, Jiu Fen was given a second lease of life again as the locals from Taipei and neighbouring regions flocked here in search of the sets in the Cannes-award winning movie. The second wave of interest to this quaint little mountain town came from the Japanese tourists who came to relive the actual places that is said to have heavily inspired Japanese anime master, Hayao Miyazaki’s “Spirited Away”. The original dessert, as the name suggested used taro. Calling it “yam” is a misnomer as the latter actually refers to another root vegetable. With time, locally grown orange sweet potatoes were used to make “地瓜圆” di gua yuan or otherwise known as “番薯圆仔” or han zee ee ah in Taiwanese. Some others have improvised and used the Japanese varieties of yellow and purple sweet potatoes as well as pumpkin, chinese yam （nagaimo) and even purple chinese yam (yes there is such a thing!). Jiu Fen, The taro and sweet potato balls, through famous stalls like 阿赖婆 and 阿甘姨 became synonymous with Jiu Fen. 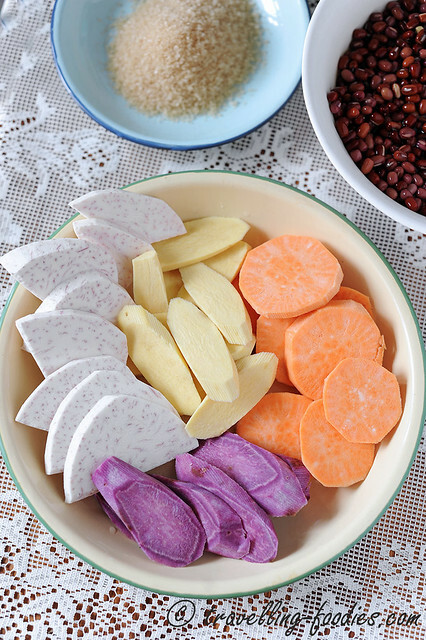 The sliced root vegetables are first steamed until they are thoroughly cooked before being mashed into pulp and added with sweet potato flour (番薯粉) to form a soft dough. 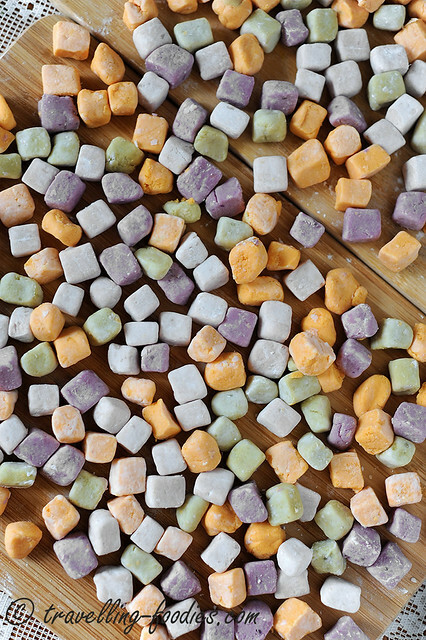 Tapioca flour has also been added by some for the same purpose but note that the texture of the taro balls obtained would be different slightly. The amount of flour to be incorporated also differs quite significantly. Orange sweet potatoes, having the highest moisture level amongst the four types I’d used, required the most flour while purple sweet potato, characterised by its grainy and considerably drier texture required the least. The actual amount of flour required varies with the specific sweet potato or yam used actually. Even with two yams of the same size, the one which is lighter and thus less moisture content would thus require less flour for the same amount of yam used. Thus, it all boils down to getting to know what consistency to be looking for. Much of a trial and error but the recipe is a rather forgiving one. when unsure if the amount of flour added is correct, it is always better to err on the lesser end, try boiling a few taro balls and test the textures in situ, and adjust with more flour or water along the way. Since now two yams or sweet potatoes are the same, no recipe would be the same either. It is possible to prepare the taro balls in advance and freeze them raw. This can be easily done by dusting the cut taro or sweet potato balls with a thin layer of corn flour (太白粉), laying out the balls to dry slightly before packing them into plastic bags. During storage in the freezer, it is best for the balls to be laid flat as individual layers and not clumped up. This again, prevents the balls from sticking together, the same logic for rolling a layer of corn flour over them. They are good in the freezer for up to two months or perhaps even three! The actually cooking process of the taro and sweet potato balls is also worth paying attention to. Firstly, the water must in a rapid boil before the balls are added. They would otherwise just disintegrate to from a starchy slurry. When the balls are initially added, they have to be stirred and swirled constantly but gently to prevent them from sticking to the bottom of the cooking vessel. Keeping the water boiling at all times is important as the turbulence of the water helps prevent the balls from sticking to the bottom or each other. When the balls are first cooked, they will begin to float to the surface. DO NOT REMOVE THE BALLS FROM THE COOKING WATER AT THIS POINT. Instead, a small amount of water at room temperature needs to be added to the pot, a procedure known in Chinese culinary arts as “点水”. The purpose of doing so is to rapidly lower the temperature, so as to allow the balls to contract slightly and thus become more chewy, or otherwise known as “QQ” texture to the Taiwanese. The 点水 procedure is repeatedly once and sometimes twice. Once the taro balls are ready to be drained from the cooking water, they need to be tossed in a mixing bowl containing granulated sugar. The residual heat from the freshly cooked taro balls help to melt the sugar. And being hot, the taro balls have greater permeability thus increasing the absorption of the melted sugar into the balls, so that they are not merely coated superficially with the thick syrup, but is sugary to the core. The syrup not only also acts to prevent the taro balls from sticking with one another, but also creates a glistening effect on the surface making them all the more appetising and appealing! The taro balls are best left to steep for a couple of hours in the sugar bath until they have thoroughly cooled down before being used in desserts. This not only helps to make the taro balls sweeter by providing more time for the absorption of the syrup, but also prevents the ice added subsequently from melting too fast. There are actually many ways to eat Jiu Fen taro balls. In cold and rainy Jiu Fen during the winter months, the best way to eat them is in a bowl of warm ginger brown sugar syrupy soup. 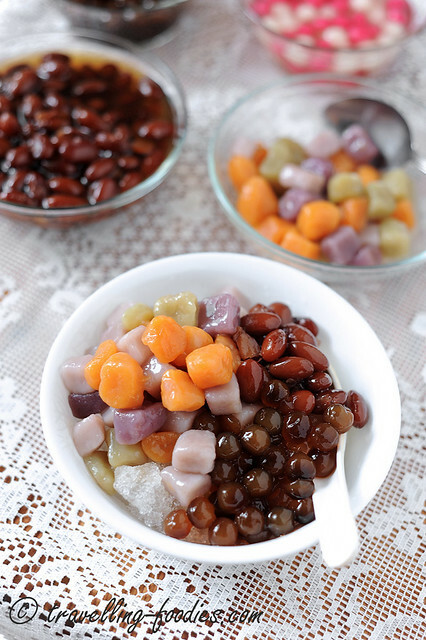 In summer however, they are eaten with crushed or shaved ice, often accompanied with other condiments like candied red beans, green beans, tapioca pearls with a finally drizzlingly for syrup. 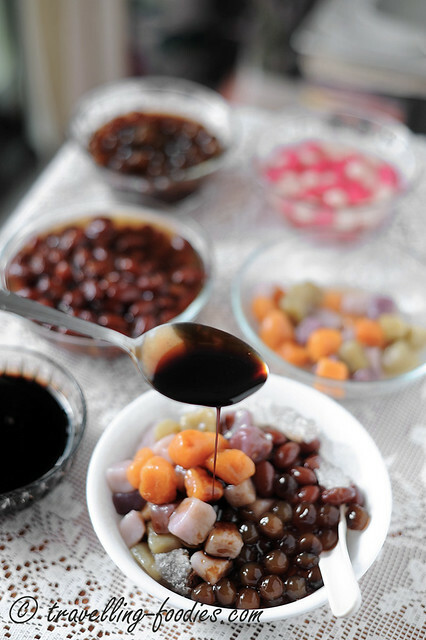 My preference is to use 黑糖蜜, a type of muscovado syrup, which is essentially unrefined jaggery from sugar cane juice. The concoction is truly ho chiak! *can be substituted with other varieties of sweet potato but adjust the amount of flour accordingly with the differing levels of moisture. Slice taro and sweet potato and steam for 20-30 min under high heat. While the freshly steamed taro is still hot, mash the taro in a mixing bowl with a potato masher or back of a fork and add light brown sugar, using the residual heat and moisture from the steamed taro to melt the sugar slightly. Add sweet potato flour and mix thoroughly, kneading everything together to form a dough. Add a teeny bit of warm water (from steaming taro) if the mixture is too dry, or a bit more sweet potato flour if it is too wet. Roll the dough to elongate and divide the roll into two. Take one piece and continue to elongate the roll until it is slightly thinner than the desired thickness, appro 1-cm diameter. This is because the balls would expand slightly during cooking to reach the correct size. Using a pastry cutter or knife, cut the dough into 1 cm thick discs. 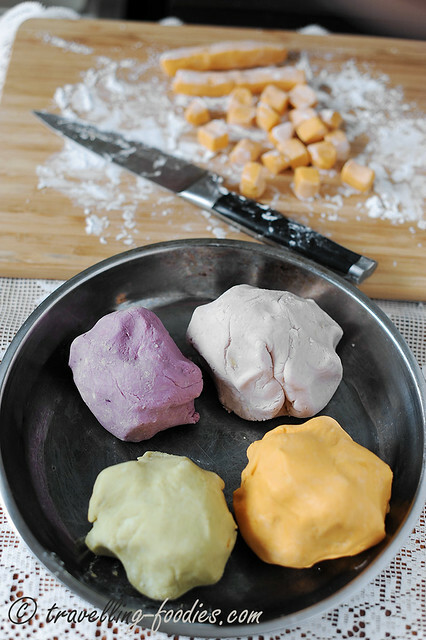 Roll and thinly coat the small pieces of taro balls in a bowl of cornflour. Set aside to cool down to room temperature. If the taro balls are not to be cooked immediately, they can be left over the counter top to dry slightly (appro. 30 min) before being bagged and stored in the freezer. Repeat the procedure with the steamed sweet potato but do note that more or less flour may be required, depending on the variety of the sweet potato used. To cook the taro and sweet potato balls, bring a pot of water to a rolling boil. Carefully drop the balls into the water and cook until they start to float. Add 2-3 tbsp of water at room temperature to lower the temperature of the cooking water and impede boiling process. This is known as 点水 dian shui. Allow the cooking water to come to a boil again and repeat the dian shui process for another 2 times. Using a slotted spoon, carefully drain the cooked taro balls into a mixing bowl containing 2-3 tbsp of light unrefined sugar (二砂). Toss the balls gently in the sugar to melt the sugar as much as possible. Set aside to cool down slightly, preferably to room temperature. To serve, place some shaved or crushed ice in a dessert bowl. Scoop a generous ladle of taro and sweet potato balls on top. 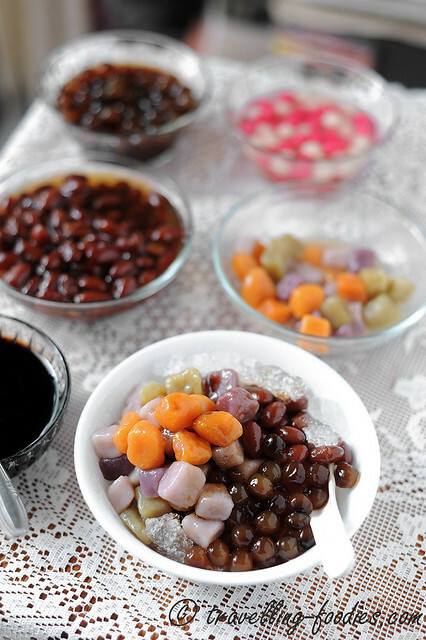 Add other condiments like candied red bean,, tapioca pearls etc if desired. Drizzle 1-2 tbsp of 黑糖蜜 syrup over the ingredients and serve immediately! This entry was posted on August 29, 2014 by Alan (travellingfoodies). 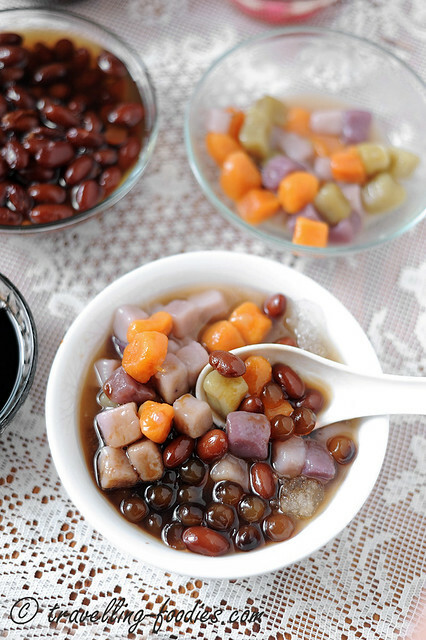 It was filed under Food, Simple Eats and was tagged with candied kidney beans, 番薯, dessert, 芋圆, 芋头, 阿甘姨, 赖阿婆, iced dessert, jiou fen, jiu fen, sweet potato, tapioca pearls, yam taro, 冰品, 台北, 台湾, 地瓜, 小吃, 东区粉圆, 九份, 九份芋圆. Great post! I went to jiufen once and few in love with these taro balls. When I found them back in Singapore, I was really disappointed because they were less chewy, or too tough. Thanks for the recipe, hopefully I’ll get down to the kitchen to try it some day! Had these at Jiufen and saw the people making them right in front of you. Would love to make these. Can I use tapioca flour instead of sweet potato flour? well, there are folks who do use tapioca flour in place of sweet potato flour. But the real jiufen taro balls use sweet potato flour really. So I would really encourage you to use sweet potato flour if you can find it where you reside for a more authentic version. If you are in Singapore. sweet potato flour can be found at Cold Storage as well as larger NTUC outlets. Above the “Method” in the “Other” section there is no hyperlink to “recipe here””candied red beans, green beans, tapioca pearls”. Perhaps you can edit & update then notify me so I can continue reading & explore how to actually do this using your method & recipe.